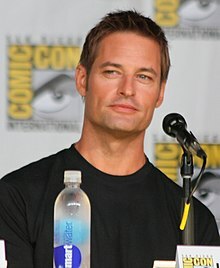 Joshua Lee "Josh" Holloway (n. 20 iulie 1969) este un actor american cunoscut în special pentru rolul lui James "Sawyer" Ford din serialul Lost. 1999 Angel Good-Looking Guy Episodul: "City of..."
2001 Walker, Texas Ranger Ben Wiley Episodul: "Medieval Crimes"
2003 CSI: Crime Scene Investigation Kenny Richmond Episodul: "Assume Nothing"
2003 Lyon's Den, TheThe Lyon's Den Lana's Boytoy Episodul: "Separation Anxiety"
2004 NCIS Sheriff Episodul: "My Other Left Foot"
2004 Good Girls Don't Eric Episodul: "Addicted to Love"
2011 Community Black Rider Episodul: "A Fistful of Paintballs"
2013 Yo Gabba Gabba! Farmer Josh Episodul: "Farm"
^ Keck, William ( 25 aprilie 2011 ). „Keck's Exclusives: First Look at Josh Holloway Back in Action”. TV Guide. Accesat în 27 aprilie 2011 . ^ „Yo Gabba Gabba! Series 4 Episode 12 Farm”. freev.com.au. Accesat în 12 mai 2013 .